Justin Fleming has forged a well-deserved reputation for his impressive adaptations of Molière plays, updated to contemporary times and written in verse with Australian vernacular thrown hilariously into the mix. Bell Shakespeare has already staged three of them: The School for Wives, Tartuffe and The Literati (co-produced with Griffin Theatre). In 2019, the company will produce Fleming’s new version of The Miser starring John Bell. The Misanthrope, which is also co-produced with Griffin, has much of Fleming’s wonderfully clever, witty use of language with various rhyme schemes used for different characters. But dramatically it isn’t as lively, funny or engaging as the previous three productions. Molière’s original play premiered in 1666. A satire about the hypocrisies of 17th century French aristocratic society, the central character Alceste can’t stand the flattering, fawning behaviour of his peers and tells the unvarnished truth, making him very unpopular. Nonetheless, he still can’t help falling for Celimene, a flirtatious young woman whose flighty behaviour represents everything he despises. Fleming has updated the play to contemporary Australia, setting it in the music industry. He has also changed the gender of several characters, with Alceste (Danielle Cormack) now a savvy woman at the head of a recording company, and Celimene a pansexual young pop star who is one of her clients, here called Cymbeline (Ben Gerrard). The popular culture setting works well, with the music industry awash with the kind of pretensions and obsequiousness that Molière was railing against, but the gender flip isn’t entirely successful. It’s hard to believe that Cormack’s Alceste could ever fall for the preening, promiscuous Cymbeline who is obsessed with gossip, celebrity and himself. Their relationship never really convinces. Molière’s Alceste is grumpy but a satirical character with a real point to make; even if you don’t like him he needs some kind of charm so that you respect what he stands for. Directed here by Lee Lewis (who previously directed The School for Wives and The Literati) Cormack throws herself into the role but as the play progresses she becomes so angsty and cranky that the character is incredibly hard to relate to, quashing much of the potential comedy. Gerrard gives a vibrant portrayal of the narcissistic Cymbeline, who is frequently seen filming a music video in various costumes, usually with his ripped bare chest prominently on display and pictured on a unicorn at one point. Alceste’s best friend Philinte is now a woman called Philippa (Rebecca Massey) who tries to save Alceste from herself and keep her out of trouble. Celimene’s female relative Eliante has become Eleanor (Catherine Davies) who is Cymbeline’s sister and smitten with Alceste. Simon Burke plays the self-righteous Arsenio who also has a thing for Alceste, to Cymbeline’s annoyance, causing friction between the two. Hamish Michael plays Orton, a pretentious songwriter with umpteen social media followers, who is given a serve when he sings for Alceste who dismisses his internal rhyming as a crime, sending Orton off in a huff. Michael also plays Cleveland, who like Anthony Taufa’s Agnus, is an admirer of Cymbeline’s. Designer Dan Potra opens the play in some kind of backstage area with costume racks and touring cases for music equipment, where the characters have to fight their way through all the props. Potra then gradually opens up the stage as the play progresses. 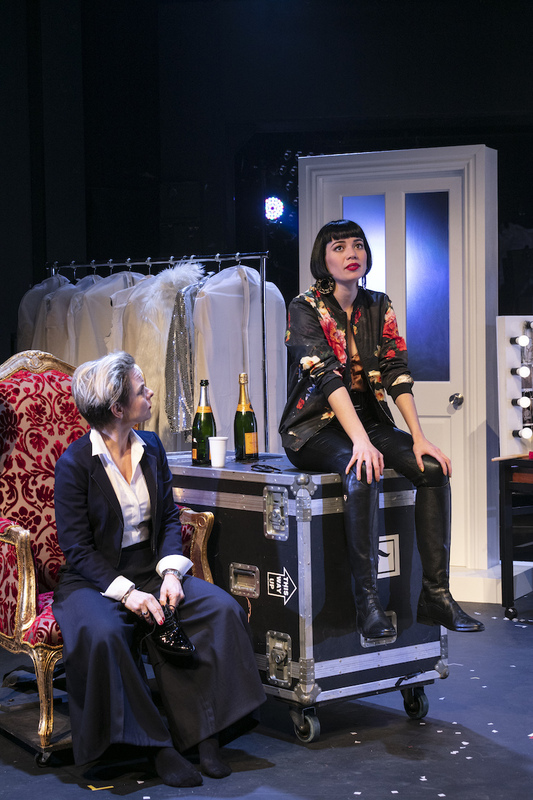 His costumes add plenty of glamour and colour, lit by Matthew Marshall, as does Max Lambert and Roger Lock’s music and sound design, particularly the riff for the new song that Cymbeline is recording. Fleming’s witty writing is frequently a delight but it’s a very wordy play and somehow the production never quite gets into top gear. You can feel Lewis and the cast all working hard to make it fire. At times it takes off, but there are also longueurs. We don’t care about any of the characters and neither the comedy nor the satire really hit home. That said, there’s still plenty to enjoy in Fleming’s clever text, and at least one happy ending – though, as you’d expect, not for Alceste and Cymbeline. He takes on the title role of Molière’s The Miser for Bell Shakespeare after departing the company in 2015. Toxic career ambition and modern media’s cynical sensationalism drive this clever new American satire. The set and costume designer for this year's Handa Opera on Sydney Harbour talks weatherproofing costumes, reanimating opera's workhorse, and giving Puccini's heroines their due.